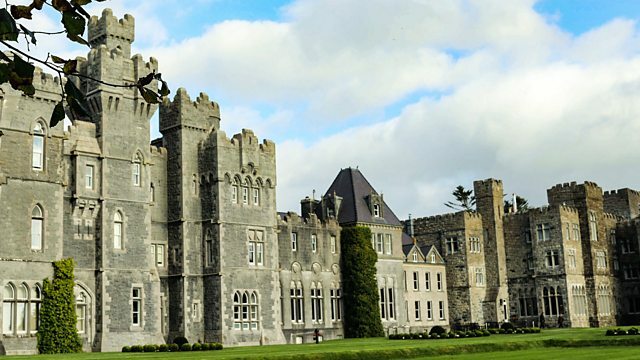 Monica and Giles work in Ireland's 800-year-old Ashford Castle, which has sustained strong community ties despite its changing fortunes over the centuries. Monica Galetti and Giles Coren hop across to Ireland to scale the imposing and ancient ramparts of Ashford Castle. Set in 350 acres, it was founded 800 years ago by the Anglo-Norman De Burgo family, and much later became the family home of the Guinness family. With the help of hotel historian Fintan, Giles discovers that the castle has had a rollercoaster journey through the centuries, sporadically reaching moments of real jeopardy, only to be saved by a turn of events or new owners. As recently as 2011, the hotel went into receivership but was bought in the nick of time and, after undergoing a £50 million restoration, has the ambition to be the best hotel in the world. Giles and Monica soon learn that the secrets of the castle's success are the people who work there and the hotel's strong, long-running community ties. The hotel swarms with local family members co-working, some of whom have ancestors who served here too. They are given a crash course by estate manager Thomas in how to greet guests with Irish charm. They both take up their posts with gusto and have varying degrees of success with gatehouse-to-lobby communications. Thomas also deploys Giles and Monica in the clay-pigeon shooting range, where they clean guns, stack clays and take potshots for themselves. Monica adds some new hotel strings to her hospitality bow by wrangling the hotel's falcons (part of the on-site school of falconry), assisting a hotel supplier and local oyster farmer, as well as accompanying hotel forager Brian to a secret location to track down pepper dulse for the kitchen. Meanwhile, Giles crashes his way through silver service in the George V restaurant, taking comfort from maitre d' Martin's assurance that his charm makes up for his lack of table skills. Although charm doesn't help Giles pass the four-poster bed-making test in housekeeping, he does impress a colleague with his prowess at vacuuming the intricate and expensive fabric wallpaper adorning the castle's bedroom walls.